Popeye and Bluto are fighting for the heart of Olive Oyl. 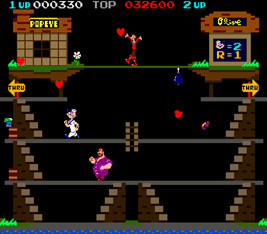 As Popeye, you must collect the items that Olive throws from the top of the screen. If any items hit the bottom then you have to grab them quickly before you lose one of your lives. All the while you must avoid Bluto, who runs around trying to clobber you. The Sea Hag appears at the edges of the screen on some stages, throwing bottles and skulls. Popeye can grab the can of spinach to make himself temporarily invincible, and letting him knock Bluto into the water for bonus points.